The other day we experimented with a recipe by Jamie Oliver. It had fired up my Weber and was ready to go. ‘Spiedini di salsiccia e manzo’ was the dish, we intended to cook. The photo above gives you an idea. In Jamie Olivers recipe you stick the meat and the sausages on firm sticks of fresh rosemary. We used skewers instead. But I will try it with the rosemary sticks if I prepare this dish in Australia next time. We marinated the meat in a “magic potion” for a long time before sticking them on the skewer. 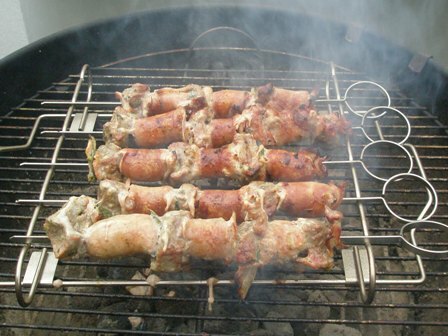 Make sure that you put about 3-4 pieces of pancetta on each stick, also the sage interspersed with meat needs to be part of each skewer. I whacked them on the “barby”, turned them around a few times, all in all about 20 minutes suffice to make them the most delicious food you ever had. You can serve them with polenta, or potatoes, or just eat them with bread. Have a beer or two, or a glass of cold white wine. Voila, a great meal. Thanks Jamie for the hint, we loved your recipe. This entry was posted on Sunday, December 6th, 2009 at 11:21 am and is filed under food. You can follow any responses to this entry through the RSS 2.0 feed. You can leave a response, or trackback from your own site. Huffman Tx! Just wanted to mention keep up the good job!